This morning (December 10th, 2013), at the annual Bard Birthday Benefit Breakfast organized by the New York Preservation Archive Project (NYPAP – full disclosure: on whose Board I now sit), the Project’s assembled supporters watched raptly as documentary filmmaker Michael Rossi showed clips from his new film about Penn Station. The documentary will air on PBS, as part of the “American Experience” series, on February 18th, 2014. The Bard Birthday Benefit Breakfast – which this year marked its own tenth birthday – honors the memory of Albert S. Bard, the lawyer who, in the words of this morning’s program, “drafted the New York State authorizing legislation for the Landmarks Law and secured its passage in 1956, at the age of 89.” NYPAP exists to document the history of New York’s preservation movement – making Bard an excellent choice for the Benefit’s name. As in years past, preservation advocates from all over the city gathered to support NYPAP’s mission, to meet up with friends and colleagues, to eat breakfast (scrambled eggs, bacon, French toast, bagels, croissants, and fruit for the health-conscious), and to enjoy a program focusing on some aspect of the history of historic preservation. The choice for the program must have seemed easy enough. This has been a year for major anniversaries involving landmarks battles and great train stations: the 100th birthday of Grand Central Terminal, which survived threats to its existence, and the 50th anniversary of the demolition of Penn Station, which of course did not. Rossi’s remarkable documentary marks that 50th anniversary (even if it won’t air until next year). Following a glowing introduction by Lorraine B. Diehl, author of The Late Great Pennsylvania Station, Rossi described the archival work he undertook for the project, and then showed snippets from the film. These focused on the “Rise” part of the story – because, Rossi said, the “Fall” part is so well known. 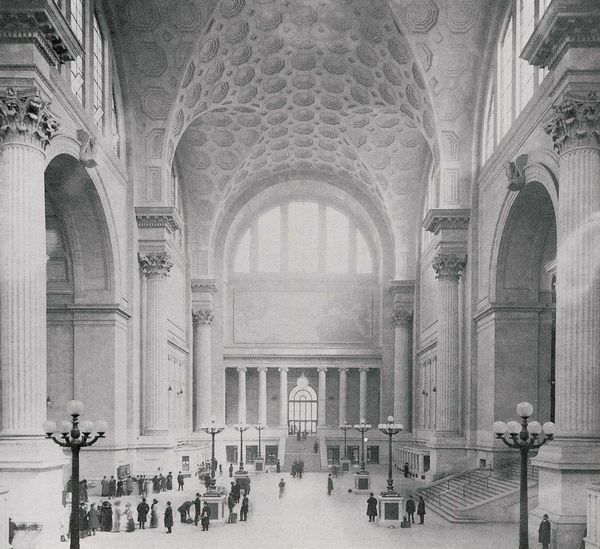 They included documentary photos of the station’s extraordinary construction; photos of the sandhogs tunneling beneath the Hudson River to bring the tracks of the Pennsylvania Railroad into Manhattan; photos of the completed terminal in all its glory; and interviews with historians and critics. The clips Rossi presented were, simply, breathtaking, and a reminder of what exactly we lost in 1963 with the demolition of this extraordinary structure. Of course, everyone in the room – from eager young students to scarred veterans – already knew exactly what Penn station had meant to the city, and how devastating a loss it was. The story was hardly news to anybody there. And yet the film had us all mesmerized, as it showed us just how spectacular a monument this train station once was, and just how appalling its demolition. Here was one of the finest civic monuments this city ever had, and the city simply threw it away. Preservation battles often take over the lives of preservation advocates, who sometimes wonder why they’re still fighting these battles. This morning’s program reminded everyone in the room exactly why New York has a Landmarks Law, and how important it is to the city – and why those battles are worth fighting. We’ll all have to wait until February to see the finished product, but you can get some inkling of what’s coming from a collection of related images here. For a summary of the preservation battle, with references, the best place to start is the NYPAP on-line archive. Previous StoryPoint taken: The new One World Trade Center is officially the tallest in the U.S.